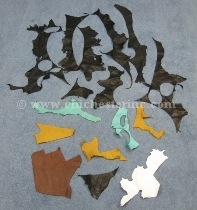 We sell assorted premium leather scrap in 1/2 lb. (8 oz.) bags and by the pound. The 8 oz. bags contain lightweight (<4 oz. weight) suede scrap in assorted cow, goat, pig, or deer leathers. The scraps sold by the pound are nice lightweight leather. Colors range from earth tones to brighter colors. This scrap comes in different shapes, sizes, and colors. Unfortunately, we can not sort this product and cannot guarantee similar colors and shapes throughout an order. 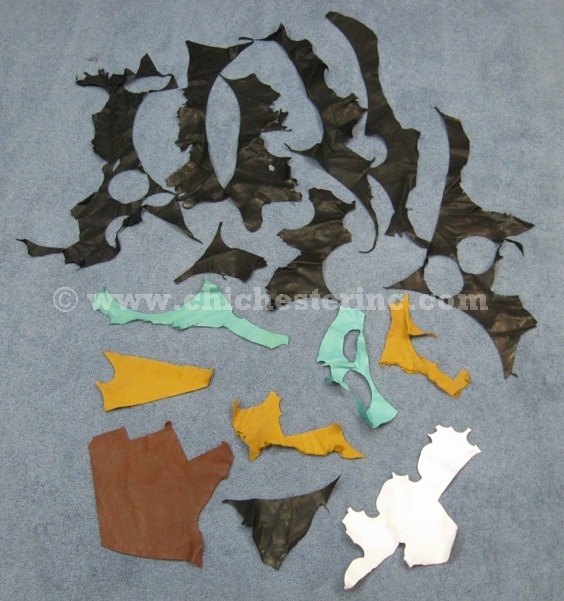 R-369-LP100 Premium Leather Scrap:Assorted Sizes (lb) US$14.00 / lb. Genus and species of goat: Capra hircus. Ranch. Genus and species of pig: Sus domestica. Ranch. Eight ounces of leather is shown in the picture. This picture shows 1 lb. 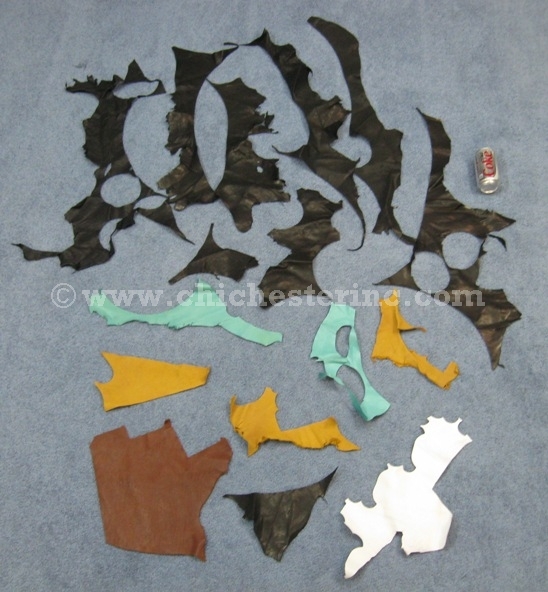 of assorted sizes of scrap leather pieces. We measured the pieces of one bag to give you an idea of the sizes. There were 15 pieces in this bag measuring: 9.5" x 11.5", 4" x 15", 2" x 7", 5" x 4", 4" x 11", 3.5" x 6", 2" x 6", 3" x 5", 4" x 4", 3" x 40", 3" x 19", 3" x 11", 3" x 13", 2" x 31", and 3" x 8". They will not be the same for every bag. See a size comparion with a soda can.